MM, your sister recently mentioned in a comment that you’re interested in doing mozzarella trials. I’m eagerly awaiting that one! 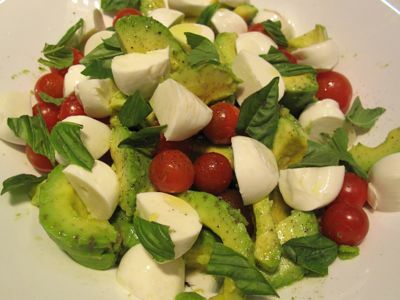 Freshly made mozzeralla or perhaps even buratta would be heaven. im suddenly craving for avocado! are they in season? Spinach Spaghetti: boil10oz/300g pasta al dente. Brwn t garlic/4T olvoil; +5c spinach 3m; +pasta/s+p. Toss+T olvoil/3T parmesan; top w parm. Garlic Chicken: mix 2lb/kg chickn/20whlclvgarlic/t oregano&rosemry/4T vermouth&olvoil&celery&wine/chop lemon/s+p. Cvr h@350F/177C; uncvr9m+. Like much the end result of the color combination very striking! A sandwich or pasta goes well with the salad. Drizzle it with a combi of olive oil and malunggay pesto with some finely cut sun dried tomato will put this salad entirely into different dimension and the good thing is that it still stay vegetarian. In that other post, somebody mentioned Hacienda Macaluan as a source for ricotta, half and half, and fresh mozzarella. It’s apparently available via Dizon Farms, Market Market, with telephone number 886-7779. Galileo Enoteca has fresh mozzarella but supply is erratic as it is flown in and easily spoiled. How wonderful to find this post when I’ve been craving avocado earlier today, and wondering of a new way to prepare it. And basil crossed my mind just now. I do like caprese, and even more so with the variation of feta instead of mozzarella … Marketman, is there Persian basil in the Philippines? Or perhaps Thai basil? Would very much appreciate your response … Beautiful photo! I found Thai basil in some of your other posts, so now I’m just curious about Persian basil, although both seem very similar to me, so it probably doesn’t matter if one already exists. Thanks, still! Cecilia, there is definitely sweet basil available in fairly large quantities. There is definitely Thai basil in some markets and supermarkets, the green variety more common than the red, here is a previous post from the archives. We used to have a bush of the green Thai basil, which is normally impossible to kill, but I managed to snuff out the life of ours. I have never heard of Persian basil, but a quick google suggests it is very close to Thai basil, so it may be available but I just haven’t come across it. T19 et al, Mr. Moo carries a locally made mozzarella, but I didn’t like the look of it… a bit grey and tough looking. I understand that other manufacturers also make it. For the imported stuff, there is mozzarella at Santis, Terry’s and increasingly at S&R. I find the ones at S&R to be reasonably priced and quite good… they are usually from Australia. Whenever I happen by Galileo Enoteca and they have freshly flown in mozzarella, I splurge and get several pieces. If you are in Cebu you can get fresh Kesong puti every morning at carbon Market, on the back of BPI where there are also Manangs selling kakanin ecery morning…she sells it for 35.00 per block or 3 blocks for 100.00 pesos. forgot to add …anybody can also get kesong puti (2 “brands”)one is vacuum sealed from a dairy cooperative in Balamban and the other one is a pack of 2blocks wrapped in banana leaves then packaged on a stryfoam packet… both are available at tha Ayala center Cebu grocery. chrisb, try to email Pia Lim – Castillo foodtravel@mac.com for products of Phil Carabao Center. I got the address from joey of 80 breakfasts. Thanks, Marketman, for the prompt response. Yes, I have read that previous post which is very informative… Never seen purple basil. wow! very pretty and looks very yummy! id be happy to eat that with bruschetta! This avocado salad is screaming summer. It’s very pretty I’m sure it tastes just as good. I bought an avocado for an avocado and mango salsa and now I’ve changed my mind I’ll make Mr. Market Man’s avocado salad instead. Thanks Corrine! Will save her email address for future reference. MM, if you want to try making your own mozarella, try this site, you would be surprised how easy it is to make (30minutes). I’ve tried making the kesong puti from the site and it was easy. Just be aware that to make the milk curdle, you would definitely need “rennet”. i tried this recipe but instead of mozarella i used akram, awali or akwal cheese. i bought a 150 gms. cubed and put it in my avocado and it was heaven. this the cheese they put in a cheese manaish bread you can buy in a lebanese bakery.